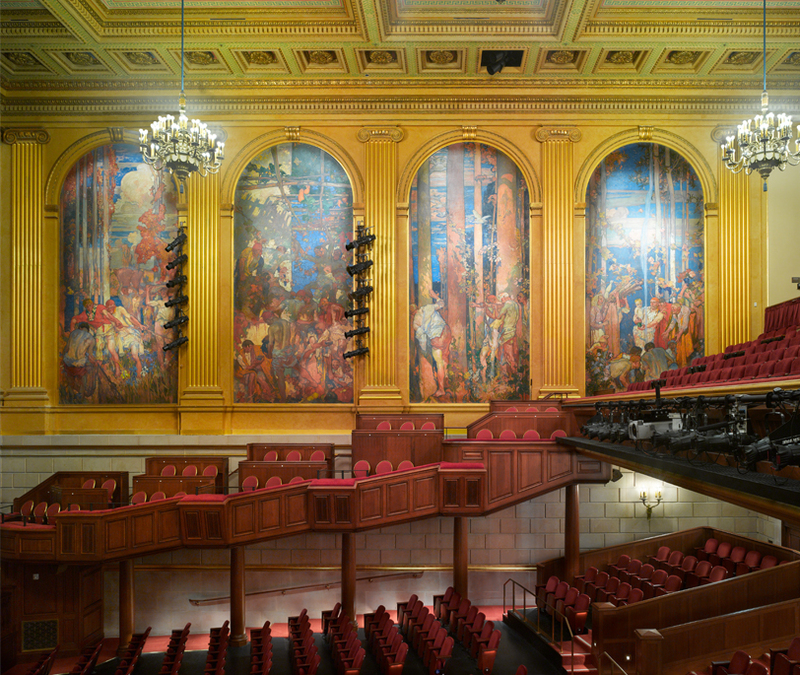 When Jennifer Norris chose new seating for the Herbst Theatre in San Francisco, she clearly understood the historic impact of her selection. As the Assistant Managing Director of the San Francisco War Memorial and Performing Arts Center, Norris supervised a massive Veterans Building renovation project from 2013-2015. It was during the refurbishment project that Norris discovered Gasser. "The Veterans Building opened in 1932 and was designed by Arthur Brown Jr. It is a beautiful example of Beaux-Arts architecture. 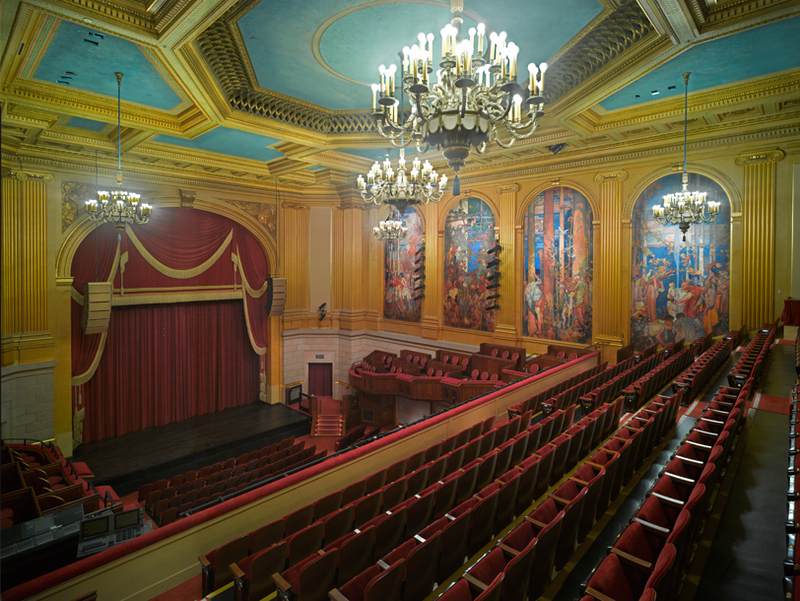 The Herbst Theatre, considered its centerpiece, underwent a seismic two-year retrofit and life safety improvement project. Everyone involved with the project agreed that restoring the historic fabric of the building was crucial to a successful construction project," Norris says. The Herbst Theatre enjoys historic significance, as it was the site of the 1945 signing of the United Nations Charter. Seven decades later, the venue hosts more than 200 performances on stage each year. It is the Bay Area's primary location for many of the most important classical presenters. These include San Francisco Performances, Philharmonia Baroque Orchestra, New Century Chamber Orchestra and Chamber Music San Francisco. Seating 892 visitors, the magnificent theater was designed around a series of Frank Brangwyn murals that were originally painted for the 1915 Panama-Pacific International Exposition. The introduction of the box seats section in 1979 added another unique dimension to the venue and were also improved as part of the renovation. Norris states, "It was challenging to find the correct chair for the boxes because of our comprehensive selection criteria. Of course, the chair had to be well made and sturdy enough to absorb the wear and tear of many years of usage by our patrons in a public assembly setting. We thought it important that the chair be stackable to expedite safe removal for cleaning and maintaining the carpet and surrounding technical production areas. Because the boxes are compact, our preferred chair required a small footprint that would also provide comfort for patrons to sit for 90 minutes at a stretch. Finally, the seating had to be attractive while fitting in with the room's décor." Norris claims the Gasser chair they chose, the KL-9030-S10, met all the criteria and stack 10 high. She purchased 58 seats to fill the boxes, confirming only positive interactions with all Gasser Chair personnel. Gasser supplied chair samples for Norris and her team to not only sit in, but also as a way to see life-size examples of various chair back shapes, leg colors, trim styles and fabric choices. With so many design variables, Norris could pick a very distinctive chair that would complement the grandeur of the room. "We love these chairs. Over these past 2.5 years, the Gasser chair has shown virtually no wear and tear. Not a single chair has needed repair. Patrons have praised their comfort, claiming the chairs greatly improve their viewing experiences at a performance. As a manager of multiple public assembly venues, I would highly recommend this chair's usage in conference and reception settings. We at the War Memorial plan to purchase 500 more chairs for the Green Room, our historic reception space. We look forward to again working with the Gasser representatives for another favorable experience. I am confident they will ably help us select the perfect chair back shape, fabric, trim and leg color to complement and enhance the beauty of the space," says Norris.